"263. Fountain and Council-House, Glen Iris"
Photographed by Washburn, Castile, N.Y. The three visitors are standing on the rustic wooden bridge that crosses the end of the Glen Iris "lake". 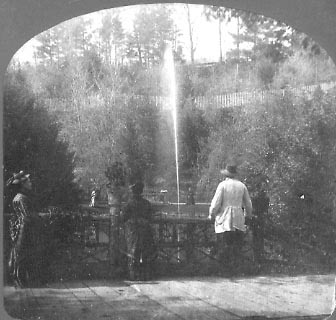 The Fountain, which still operates today, is seen in the center of the photograph. On the hillside can be seen a fence that marks the original path to the Council Grounds which were dedicated in 1872. If you look closely, you can just make out part of the Council House just above the bank to the right of the fountain.